Giga, congratulations for the quality of the information! I have a red mangrove in the refuge and bother me, really, the lack of better information to keep you healthy. I have to improve my methods, for sure! "It's amazing what people do when they do not know that they can not!" Really good information! 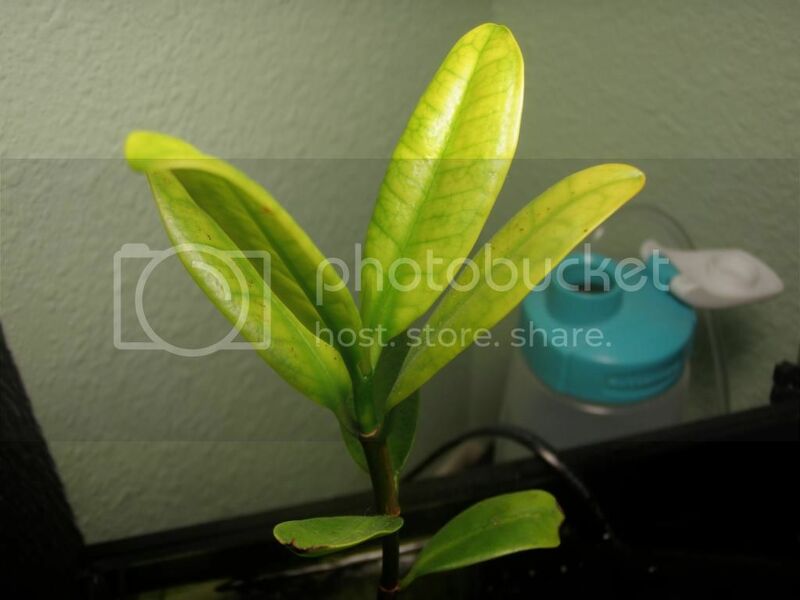 I am thinking of getting a mangrove for my sump/fuge but wonder if I have enough light. Right now I'm running a DIY LED and it's 14 x 3W yet each diode has a 90deg lens. It's bright enough to grow SPS on the bottom so I assume it's bright enough to grow mangrove at/above the water line. Would this be a safe assumption? Thanks for the advice! Giga, what diameter (in mm) wire do you use for your red mangroves? 2 through 4 mm mostly 2.5 and 3 and it only takes a month or so for the branches to set, so once you do the wire and move the branch don't touch it again till you have to remove the wire. "You said it didn't bite!"......."Well"...... "It didn't bite me." Hey Giga, I just have to express my admiration. You have some beautiful trees, and some very insightful information. 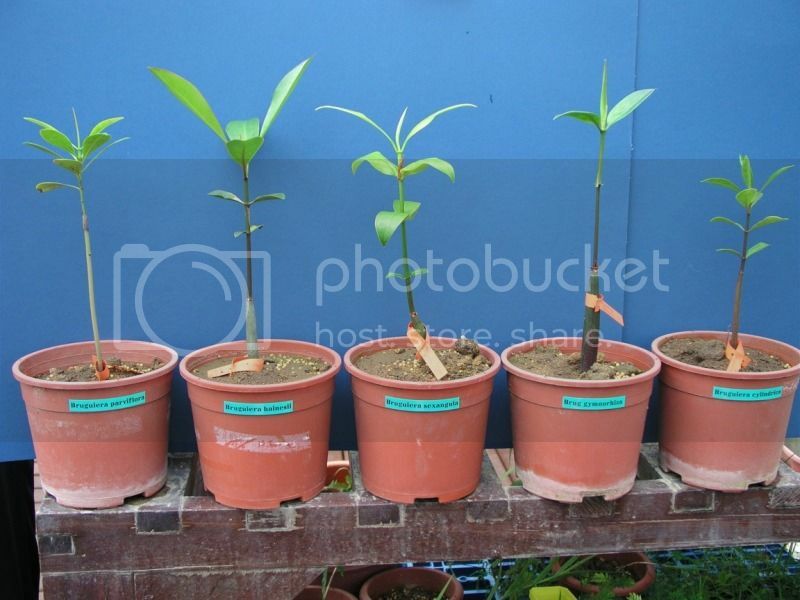 I've read lots of articles and forums where people keeping mangroves seem to think they need to suspend their mangroves out of substrate in order to grow prop roots, but as you explained in this thread that isn't the way to grow healthy plants. As a fellow mangrove enthusiast I thank you for the info and guidance! Thanks!-I'm not saying there wrong necessarily, but I feel as this is "best practice" in regards to growing mangroves, as I've been growing them a long time outside there native enviroment. It just seems like those plants fail to thrive. I have actually used the method from Anthony Calfo's article (tying plants to stakes keeping the roots out of substrate) on a tank full of red mangrove seeds and it just doesn't seem like the right way to go. The roots grow super long and they don't develop leaves at any kind of healthy rate. It's like you said, it takes up to 2 years for prop roots to develop. You should not try to force a seed to develop prop roots right from germination, that's not what they do in nature. The stem won't be green by the time aerial roots start to develop, that's a good rule of thumb. 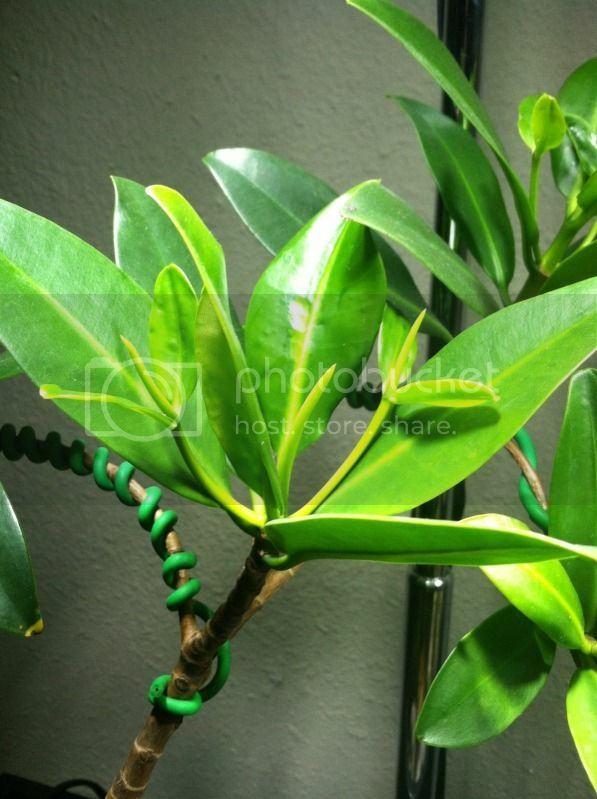 When you have new, green branches that just sprouted, do you usually wire them right away or wait for them to get longer? Last edited by 2_zoa; 09/01/2014 at 01:34 PM. Almost looks like chlorosis, which is lack of green chlorophyll. If I were to guess it would be due to lack of light and nutrients, emphasis on the nutrients. Are there fish in that tank with the mangrove, and are you doing water changes? Can also be caused by root dmg if you been moving it around at all. No there wasn't any fish in the tank but, the nitrates stay around 50 in that tank due to a lack of water changes. The tree has been in place for a good while now. Occasionally I dose the tank with phosphate. The light has been recently switched out for another one. I'm now using (temporarily) a 23 watt cfl. I want to get an led bulb for it and the tank. It could have used up the magnesium in the tank in the past. However I've started doing water changes on this tank a couple weeks ago. 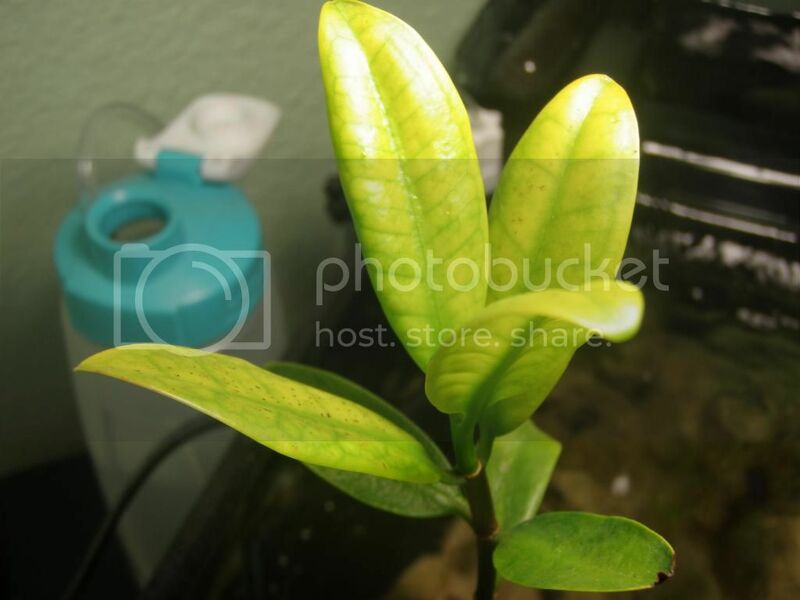 Maybe a kessil a-150 ocean blue won't grow mangroves? Way too much blue light. I know from aquaponics tomatoes and peppers having a lack of iron will yield yellow leaves. However the usual cure for that in aquaponics is chelated iron, which wouldn't work in a salt tank, also itd be complete overkill here. I haven't played with aquaponics but, I do grow hydroponically. Out doors in the summer and indoors in the winter. What substrate are the roots in? So, my tree has outgrown this small lighting. Hmmmm...What to buy? I've seen Julian Sprung's tank, he has 2 AI's over his tree IIRC. Well, What do you suggest I dose? I checked out some info just in case I was missing something, as to what macro nutrients were. With this being such a small tank I don't know where to start to build up the nutrients. It has a fish that's been in there about 2 weeks now. It's always had snails. It's always had high nitrates. I've never been able to get a reading on the PO4 in this tank. So I dose PO4 occasionally. Mag levels, I'm not sure. I currently don't have a mag test kit. It ran out. I can dose the Iron as I have some. What level do you suggest? I have no way of testing it at NSW levels but, I can test it on my Hanna Iron checker. That will then be WAY above NSW levels. I don't have any of the manganese, or zinc that you mentioned in an earlier post. They are in a shallow bed of sea floor special grade sand. No mud. Last edited by 2_zoa; 09/11/2014 at 05:19 PM. Those are pretty cool, i would like to get some myself- where did you purchase them? Most mangroves prefer 5 to 50 % strength seawater. If you use them on your reef tank with cheapo lighting you are not going to have great success in general. Yes some people do have some degree of success over long periods of time, but this is pushing the plants to there limit. Just a reminder here. Great thread and awesome write up. Those aren't mine, unfortunately, I found that pic on the internet. However, I have a couple of the species. I imported them from Asia. oh i gotca. I saw in a different thread where you had to get a permit. Very interesting trees. I just read thru again Hogarth's "Biology of mangroves and seagrasses", what an awesome book. If you know of some other books let me know. I think there is a biology of mangroves out there that i have not read. Hey Giga, I have a question about root pruning/repotting. My tree is starting to exhibit signs of chlorosis and the newer leaves are smaller so I'm thinking it's getting root bound. Do you have any tips on root pruning? I don't want to chop off some roots and have it die on me. Have you had any similar experiences? My big worry is that if I open the roots that it's going to let salt in, which obviously would not be good. Thanks! how about adding a little potassium for the leaf yellowing. oh i just checked the date on the post. How are they doing now etc? i setup a 55 gallon brackish tank about 4 months ago "shocker right", and the single mangrove i put in is doing well. i have very low salinity and some sailfin mollies that are breeding like crazy. The tree is at the top and has been sending out runners looking for some substrate. I think it would really explode if i planted it in some substrate. 55's are tall, so i need to figure out a hang on the side arrangement.